Johannes Gutenberg died in 1468, a little over a decade after inventing movable type. But he had already set in motion a gold rush-like frenzy of European entrepreneurs who flung open print shops to cash in on his technological earthquake. 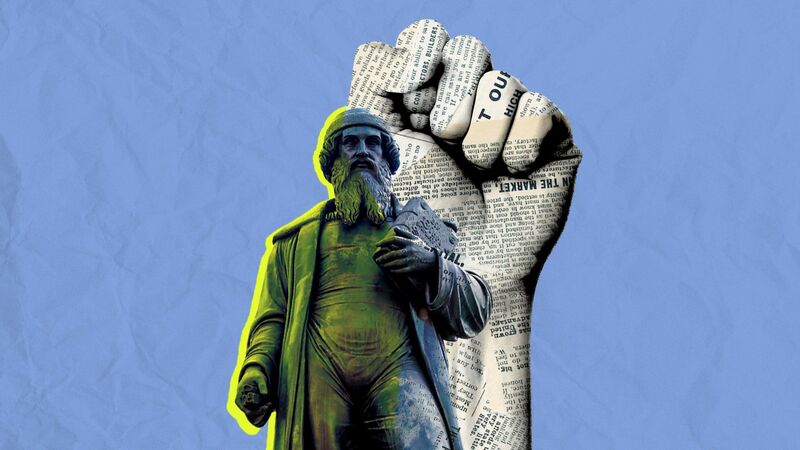 Why it matters: We may be seeing the echoes of Gutenberg's printing fever in the political and social tumult all around us, Jeremiah Dittmar, the lead author of new research published by the London School of Economics, tells Axios. This printing fever may be as responsible as Gutenberg's press itself for igniting the transformation that followed — the Reformation, the Scientific Revolution and the Industrial Age, according to the article. Today's competition for people's attention in the torrent of digitized information — blogging, the 24-hour broadcast news cycle and angry online commentary (not to mention email newsletters) — may be a key driver of the current political and social chaos. "The technology is an accelerant," says Margaret O'Mara, a historian at the University of Washington. The big picture: Competition was everything to the Gutenberg revolution, Dittmar and co-author Skipper Seabold write on their blog and in a longer paper in January. When printers of the late 15th and early 16th centuries fought for the market, the price of knowledge — books and pamphlets — plunged. From there, the ideas of Protestantism spread, radical societal and business reform followed. How they reached their conclusions: Dittmar and Seabold collected data on every known book and pamphlet published from 1454 to 1600 — more than 295,000 of them in some 200 cities. Then they tracked the opening of printing shops. The shattering of a local information monopoly with the opening of even a single added printer in a city caused book prices to drop by 25% within a decade. The price of books fell 1.7% a year for more than a century after Gutenberg. That made them "widely affordable" by the 1500s. Municipal Reformation laws followed, suggesting a link between the spread of printed material and the political upheaval. An interesting aside: Dittmar and Seabold also found that competition erupted when a print shop owner died. At once, printshop collusion fell away, further lowering barriers to entry for other printers. The value of knowing something skyrocketed — at once people who had ideas could get them into print, and cheap printing vastly inflated their audience. The pay of skilled and unskilled workers stayed flat from the late 1300s through the 1700s, but the salaries of university professors rose dramatically, especially if their specialty was science. Prior to printing, the median professor earned the same as a skilled worker. But by the early 1500s, professors earned seven times more than such workers. The bottom line: The lifting of traditional gatekeepers — the Catholic church in Gutenberg's day, and the mainstream media today — is one factor, but not everything. Paul Starr, a professor at Princeton and author of the forthcoming, "Entrenchment: Wealth, Power and the Constitution of Democratic Societies," warns against "technological determinism." "What they are missing entirely is the political and cultural context: the basic framework of control over communication (e.g., variations in censorship), the regimes of control over work (guilds) and intellectual property, and the various factors that influenced the demand for print (e.g., literacy rates)," Starr tells Axios. Similarly, O'Mara says that, in both the case of Gutenberg and today, public faith in institutions had grown thin. "Even the most transformative technology doesn’t operate in a vacuum," she said. "New media propels political turbulence because of instability or loss of public faith in underlying institutions."